Hello everyone! Today’s post is meant for all the money savvy Pinay readers of this blog. I am glad that you’ve found last week’s Best Money Moves for Pinays helpful. Rest assured that I won’t stop to empower women in the area finances. Today I am sharing a list of Must Try Side Business Ideas for Pinay Entrepreneurs about. These income-generating activities can be done part-time for when you have extra time and energy to grow your cashflow. Most of these ideas are also easy to start with and require minimal cost. If you’re read to learn these Business Ideas for Pinays then let’s get started! Many wife or single women who are in the office can do this extra income idea easily. All you need is to be a member of any of the mentioned beauty and lifestyle dealer and you can make extra money. I personally tried this before and it surely is a good side business especially if the people around you also love makeup, retail clothing and other goods. 1. Go to the nearest Avon/Ever Bilena/Natasha/Boardwalk center to you. The one I visit before is at Starmall Shaw Boulevard. If you buy 5,000pesos worth of product from Avon you get 1250pesos discount. This can be your earning once your products are sold out. This is a perfect Extra Income Idea for stay at home moms who live in busy streets or along the highway. You can start a small sari-sari store at your house with common commodities like canned goods, cooking oil, salt, sugar, snacks, candies, cigarette etc. A small window is all you need. How to be a sari-sari store owner? 1. Have an inventory of goods you want to sell. 2. Go to the nearest supermarket to buy your first set of displays. 3. Make sure that you take down notes of the price or have the receipt to assess how much each product will cost. 4. Display your products and wait for your first customer. Your income depends a lot on how many customers you get and how fast your goods are sold. Your extra income comes from the mark-up you put on each product. Offer something your competitors don’t sell. Try to add an e-Loading business so you can get additional customers. You can also start selling processed food like tocino, hotdog, embutido etc. that people can buy. As much as possible avoid credits. Do not let your neighbors start to be comfortable in making credits at your store. It is nice to help a fellow but they have to be accountable too with their actions. In case credits can’t be avoided have a clear record you can rely. Set also the deadline when they need to pay. Always look for the cheapest price. If possible go to a supermarket that offers wholesalers price. You can gain a lot of suki because of your cheap commodities. You can also apply a better mark-up. Most sari-sari store will need Business name registration, Mayor’s Permit and a BIR TIN to be legalized. Another common business you can start is anything that satisfies a person’s hunger. 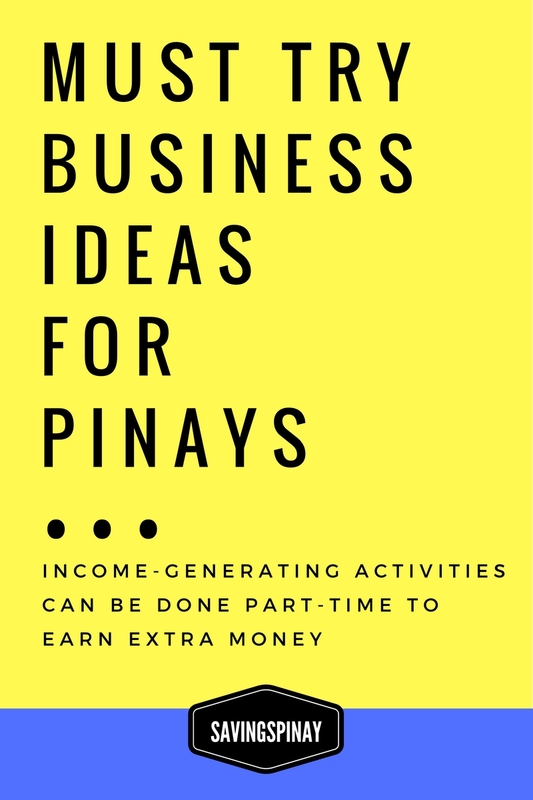 From selling common Filipino meryenda like turon, banana que, maruya, samalamig and others to a BBQ stall or almusalan, you can generate a lot of extra income. As long as you have a good location and delicious product you’ll be surprised on how your 5,000pesos initial investment can grow. How be a Food Business owner? 1. Make sure that you study what your neighborhood need and want. If you notice that there’s no “almusalan” around the area that can accommodate to people who love to eat something in the morning then open one. 2. Make sure that you perfect the taste of the food you sell. Your goal is to have repeat customers that will really patronize your food business. Any food business is a profitable business to be honest. With small starting capital you can double it in less time. What’s important is to have a good location, sell the best tasting food and have the right price. Online shops are very trendy nowadays. It offer choices and convenience to the public. Opening an online shop is free and very easy. You can even start without capital if you become a reseller. How to Start an Online Shop? 1. Create an Instagram/Facebook Page account. 2. Make sure your name is unique and easy to remember. 3. Decide on what products you’ll sell. 4. Take good photos of each product. Your Bio should have almost everything that the customers need to know from contact page, mode of payment etc. Your Photo should be your shop’s logo to look more professional. Create Shop Policies that your customer will understand and follow. Always be ready to reply on your customers. 6. Partner with a good shipping provider. Your income depends again on what you sell and how many are sold. It is better to sell something that’s unique and no one is selling for you to build a better online presence. It was during the Blogapalooza event that I discovered Fragrance Factory PH. They offer perfume making seminar and supplies for you to start your own perfume business. If you are an aspiring entrepreneur and you find joy in mixing and making perfume then this is a perfect side business. You can start selling on family and friends and soon start your own online shop. How to Start a Perfume Business? 1. Attend a perfume-making seminar/workshop. 2. Buy your supplies from bottles, mixing cups, essential oils, packaging materials etc. 3. Create your first/signature perfume to sell. Gather the reaction of your family members and close friends. If they say its a go then start then you can create a good number of perfumes to sell next. 4. For marketing you can start with your own Facebook account then create an Instagram Shop and/or try to ask salon and local beauty stores if you can store your perfumes for a small percentage. Fragrance Factory PH offers a Starter Kit that costs 3,500pesos. This includes all the glassware, essential oils and even packaging materials needed to launch your brand. Withe the 3,500pesos initial investment you can make 80 bottles of 10 ml and 30 vials of 2ml perfume. You can double your the money you invested and earn up to 2,500pesos profit. Many of you may have heard the rags to riches story of Nol Montalbo, owner of Mont Albo chain of spa. He attended a seminar on soap-making and sarted creating his own organic soaps. He personally sells and deliver the soaps until he had a big client that made it possible to start a spa business. Soap Making Business is a very good extra income ideas because of the great demand in generate. Take for example the glutathione soaps that boomed the market all of a sudden. How to Start a Soap-Making Business? 1. The procedure is almost the same as perfume-making business. You first need to attend a seminar to know how soaps are made. 2. You can also search for the best recipe and formula that will make your soap stand out. 3. Once you’ve made your first soap you need to do a benchmark on its effect in 1-2 months time. You have to perfect the formula that will make the people want to buy your soaps. 4. Marketing is also the same with perfume-making business. Endorse your created soap online to family and friends and let the word of mount do the best for your side hustle. Your income will depend on how well your soaps will be sold to public. A good 40-50% of your initial investment can return to you. We all love to be pampered every once in awhile. If you have passion in doing nail art for others then this could be the best side business for you. With a minimal amount you can start buying tools and nail polish to use on your clients. Start with your own neighborhood or ask a local salon near you if you could apply as official manicure/pedicure staff. How to Start a Manicure/Pedicure Home Service Business? 1. Make sure you know how to do nails of others. You can attend a short course about this. 2. Buy the supplies you need from manicure/pedicure kit, nail polish and nail care needs. 3. Ask around for potential client. An manicure/pedicure home service starts from 100-120pesos and you’ll only be doing it in less than 30mins. Nice, right? Not everyone can handle an event coordination business but once you gain proper experience and expertise you’ll find yourself an income generating machine. Events and special occasion calls for a helping hand from planning to execution. That’s where event coordinators come into place. They give their expert advice on what to buy and what to do and how to do it. Most women are geared towards this business because we are more keen to details and we have a ton of patience. Event coordination is very easy to be honest and you can earn plus help others in return. How to start an Event Coordination Business? 2. Sell your service online from your own Facebook account, Instagram to creating a website or online advertisement. 3. Be sure to have a working phone with load for potential clients who will contact you and to reply on clients etc. 4. Document your events as proof and marketing material. There’s no investment or money needed to start a Event Coordination Business. All you need is good communication skills and organizational skills and your side business is good to go. I hope this list helped you. I plan to keep this post updated with new Side Business Ideas for Pinay Entrepreneurs Pinay Entrepreneurs should know and try out. Use the comment section below to give your inputs and maybe other income ideas. Do you also dream of becoming a Pinay Entrepreneur? How to Invest Your 5,000pesos?